We’re so glad you’re interested in helping make rovercode even better! Whether you have years of experience or you’re pretty new to coding, you can make great contributions, and we are here to help and support you. This documentation is about the creation of the rovercode platform itself; if you are a teacher or student using rovercode, you’re probably looking for rovercode.com. 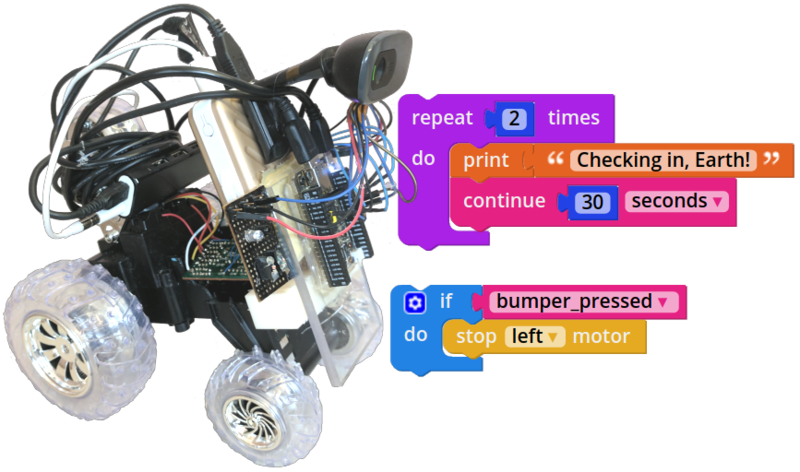 rovercode is an open-source educational robotics platform. Students create code that listens to the rover’s sensors and controls its motors, then watch the rover set out to execute that code. It combines exciting robotics with low-barrier block-based programming, all on open-source software and hardware. We are always looking for new people to help make rovercode even better. Keep reading to learn more about rovercode and how to get started contributing to its development.